Whether you own a smoke shop, head shop, or cannabis dispensary, Wholesale pyrex water pipes & bongs are a must to increase sales in your store. 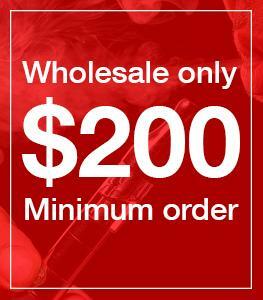 Selling wholesale water pipes along side wholesale glass pipes, wholesale rolling papers, and other smoking accessories will ensure your customers will have the selection they need when making their purchase for a new bong. your customers that enjoy smoking will want to use many different devices to enjoy their favorite smoke, and you need to make all of the most popular items for smoking available for them to purchase. At the top of the list is glass pipes as they are easy to travel with and typically inexpensive. Next in line are bongs & water pipes. 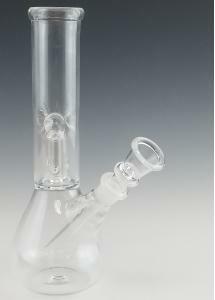 Out of the popular models of bongs and water pipes on the market the top sellers are pyrex water pipes. For serious smokers water pipes can't be beat because they offer an ultra smooth smoking experience. 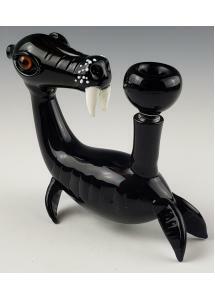 The filtering properties of the water make smoking out of a pyrex bong a favorable choice for many people. With more basic water pipes you may only have a single filtering point, but with more elaborate designs you can have many different points of filtration. When you smoke out of a higher end pyrex water pipe with many filtering points you can barely feel the smoke entering your lungs. Thus you will be able to take bigger hits which will enhance the effects of your smoking experience. Heavier smokers don't want to have to smoke all day. With a had pipe, or joint, you may have to smoke an entire bowl until the desired effects have been achieved. When you use a pyrex water pipe, you will be able to take less hits to achieve the same effects. This will save you time from constantly hitting a bowl, and give you more time to enjoy a sesh with your friends. What different options can pyrex bongs have? Early on in the headshop culture designs of water pipes were extremely plain. Some of the earliest water pipes were made form bamboo, ceramic, and eventually acrylic. Acrylic dominated the wholesale bong market for decades. They typically had metal bowls, and downstems, and came in varying lengths and colors. 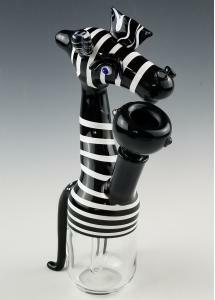 As things progressed glass was introduced into the bong market, and it caught on quickly. 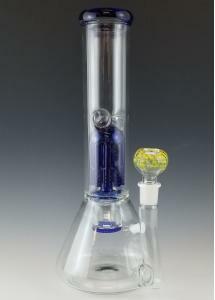 Earlier models of glass bongs were simple straight tubes with a blown out bubble as a base. A rudimentary slide was inserted into a downstem that was sealed with a rubber grommet. Back in the day this type of water pipe would seal the bowl to the down stem with a rubber o-ring. Jump forward to today's wholesale water pipe market, and things have changed dramatically. Standard down stems and bowls using grommets and o-rings are used less and less. Glass on glass fittings are the standard in the smoke shop industry today. Glass on glas fittings, or as most people call them gong fittings, use a sandblasted area to seal from piece to piece. The texture of the sandblasted surface will seal against another sandblasted surface almost like Velcro. The main benefit ti that you no linger have to use grommets or o-rings. If you are old enough you will remember having to try to track down o-rings to seal your bowl to your down stem. With gong fittings the joints are welded to the water pipe similar to how you would weld metals together. The downstem is them inserted into this joint, and the bowl inserted into that. All without the need of any other sealants. This was quite an advancement when it originally was implemented in glass manufacturing. It was originally used in scientific lab glass that was used on laboratory equipment. Glass blowers that worked in the bong market then adapted those techniques to water pipes. The most important part of a wholesale pyrex water pipe is the filtration. Basic models will just filter the water in the base of the water pipe. The down stem will be inserted into this water, and as you smoke the smoke will travel through the water, be filtered, and then you will inhale it. Once percolators were invented it took the water filtration game to the next level. Percolators get their name due to the way they percolate the water in the filtration device. 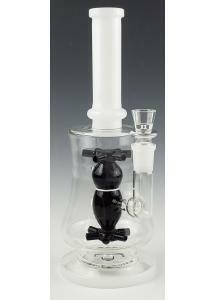 With a single perc water pipe you will get filtration in the base, and in the percolator. With multi-percoaltor water pipes you can have many points of filtration which will make the smoking experience extremely smooth. The different types of percolators that are used on wholesale water pipes are to numerous to name. Early percolators were dome style percs, and tree style percs. Both of these get their names form the way they look. As glass blowing techniques evolved the insertion of disc percs into bongs became very popular. A disc percolator is made of a glass circle that has holes of some sort in it. A basic disc perc, the honeycomb perc, has tons fo little holes poked into it. The tornado or cyclone disc perc has angled slits in it to drive the water in a spiral direction like a tornado in your bong. Fritted disc percs are made from little piece of glass, known as ftit, and the water percolates through the tiny holes between the pieces of frit. Standard pyrex glass comes in clear tubes. When worked on a lathe and made into a water pipe this will be called a wholesale scientific lab glass bong. 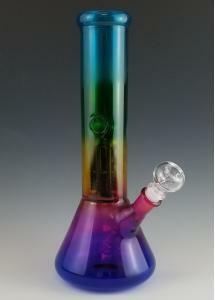 This type of water pipe can be made from colored glass tube, or the artist can create different sections of glass out of color glass rod and incorporate it into the bong. 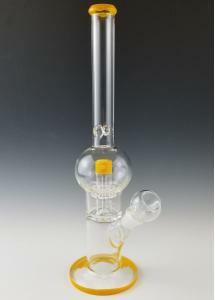 The benefit of color glass tubes and rods being used in the making of bongs is that when it gets dirty you won't see the resin as much as you would see on a clear lab glass bong. 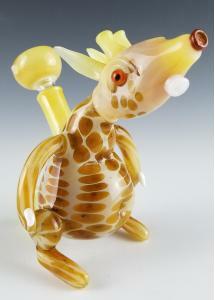 Custom glass bongs made have been a big business for many years. The prices range drastically. 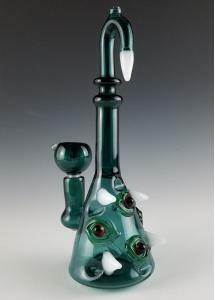 American glass blowers have created super high end bongs that are collected like pieces of art. They are indeed pieces of art, but they are known as functional art. When we got into this business all those years ago we would have never thought that people would be smoking out of $20k bongs. High end bongs and water pipes have their place in today's market. They drive all artist to up their game, and tweak their techniques to create new and interesting pieces of functional art. No matter your budget, selling wholesale pyrex bongs in all price ranges will draw a large customer base into your store to make their next purchase for that special bong. No better selling point than someone bragging about the piece they bought form your store, sharing a smoke with a friend, and then the friend coming in to buy a water pipe. It's the earliest from of social media. 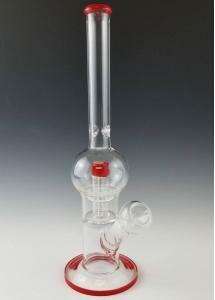 13" Tall 4" Diameter Base Red Button PercolatorIce Catcher Pinch 18mm Male Glass on Glass Bowl..
13" Red Button Percolator Gl..
13" Tall 4" Diameter Base Yellow Button PercolatorIce Catcher Pinch 18mm Male Glass on Glass B..
13" Yellow Button Percolator ..
13" Tall 2.50" Diameter Mouth Piece 5" Diameter Base Beaker Base Shape 18mm Male Glass on Gl..
13" Beaker Base 11 Arm Tree Pe..
12.5" Tall 5.125" Diameter Base Downstem Percolator3D Style Glass OctopusIce Catcher Pinch 18m..
8.5" Tall 3" Diameter Base Barrel Percolator Handle Double Chamber Design 14mm Male Glass..
BARREL PERCOLATOR WITH HANDLE WATER..
8" Tall 1.50" Diameter Mouth Piece 3" Diameter Base Beaker Shape 14mm Female Joint 14mm Co..
Beaker Bong With Ice Catcher and Pe..
5" Tall 6" Wide Walrus Design 14mm Male Glass on Glass Bowl Included ..
9" Tall 3" Diameter Base Hand Carved Four Eyed Horn DesignCurved Mouthpiece with Stinger 14..
FOUR EYED HORN HAND CARVED GLASS WA..
7.5 Tall 2.5" Diameter Base Honeycomb PercolatorGenie Bottle Design 14mm Male Glass on Glass B..
Genie Bottle With Honeycomb Percola..
5.5" Tall3.75" Diameter BaseGiraffe Shaped Water PipeCustom Glass Work Throughout14mm Female Built I..
10" Tall 4" Base3.5" Body DiameterBuilt In Down stemHanging Tree & Turbine Percolator Dou..
Green Slyme Eye Ball, 8 Arm Per, Ba..
6" Tall8" Base2.75" Overall widthT-Rex Design Pyrex Water PipeCustom Glass Claws & TeethHand Mad..
Jurassic Dinosaur T-rex Pyrex Glass..
7.75" Tall3" Base2.25" Overall widthMarty The Zebra DesignBlack & White Striped GlassClear Pyrex..
Octopus 6 Arm Inline Recycler Pyrex..
11.5" Tall 4.35" Wide Base Penguin Percolator Design 18mm Male Glass o..
12" Tall 2.50" Diameter Mouth Piece 4.75" Diameter Base Beaker Base Shape 18mm Male Downstem..
Rainbow Bong w/ 11 Arm Tree Percola..